This book contains three novellas by one of the major writers of Russian literature. The first, A LEAR OF THE STEPPES, is a brilliant re-imagining of Shakespeare’s play King Lear, wherein a larger-than-life father makes a life-altering decision with consequences unforeseen by him. FAUST begins at Section 11. In a series of letters to a friend the writer recounts his chance meeting with a married woman whom he had known years earlier when both were single and committed to each other. The ensuing events are vividly revealed in the letters. Section 19 introduces ACIA, the final “ETC.” of the book’s title. Turgenev poignantly portrays the twists and turns of human emotions in this moving psychological portrait of two people who fall in love. Leo Tolstoy believed Acia to be one of Turgenev's greatest stories. . . .What are you saying?’ my mother interrupted him. ‘I. Didn’t you know it?’ Harlov sighed. ‘Well, so.… Over a week ago, madam, I lay down, on the very last day of eating meat before St. Peter’s fast-day; I lay down after dinner to rest a bit, well, and so I fell asleep, and dreamed a raven colt ran into the room to me. And this colt began sporting about and grinning. Black as a beetle was the raven colt.’ Harlov ceased. I actually enjoyed it, seeing the parallels with Shakespeare's King Lear (duh, the title gives it away). But still, I was a little bit surprised by the ending and a bit sad. But I'm glad I've read it. I hope we get to discuss it in class, at least a little bit. 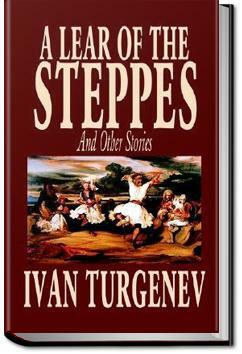 I'm on a King Lear kick right now, so read this late in his career novella by Turgenev. Yes, "loosely based" - for example, only 2 daughters. Lots of 19th C performances of the play did not have the whole family dead at the end, so that works here as well - only some of them die. Дуже сильно сподобалась ця повість Тургенева. В якій присутні всі характеристики доброї російської повісті. А саме: занудність, дворяни, хтось помішаний на своєму походженні, хтось захворіє, когось одружують, хтось помирає. Якщо щось пропустив, то добавте. You may read online here.